Please be advised that I will be on leave starting tomorrow for sorry business and will return to work on the 23rd April 2015. In my place, acting as station supervisor is Elijah Blair and Riana Kielly. If you have any queries for the duration of time I am away, please do not hesitate to notify the station on the number below. All volunteers and staff of 4US are to come in and record their shows as per usual. 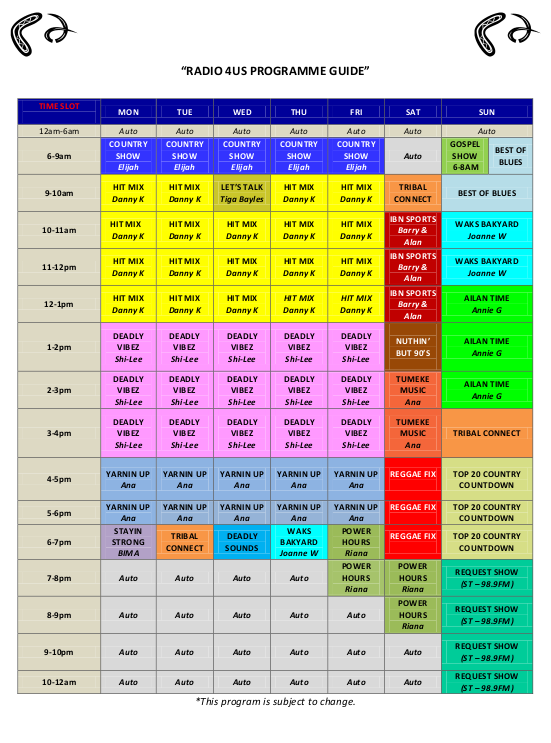 If you cannot make it in on the due day/time please call the station to re-schedule. Until then, enjoy your week/s and I will see you all when I return. Thank you! Our office close date of business for the holiday break is on Friday 12th December 2014. Radio 4US will return in the new year on Monday 5th January 2015. It has been a pleasure working with you through the years/to date and we look forward to working with you in the new year. From all of us here, we wish you all a happy and safe Christmas and a great New Year! We would like to take this time to thank all our deadly listeners throughout the year. We have enjoyed spending time with you, in your kitchen, lounge, bedroom, car, around the campfire, under the house or wherever else u mob have been tuning in. 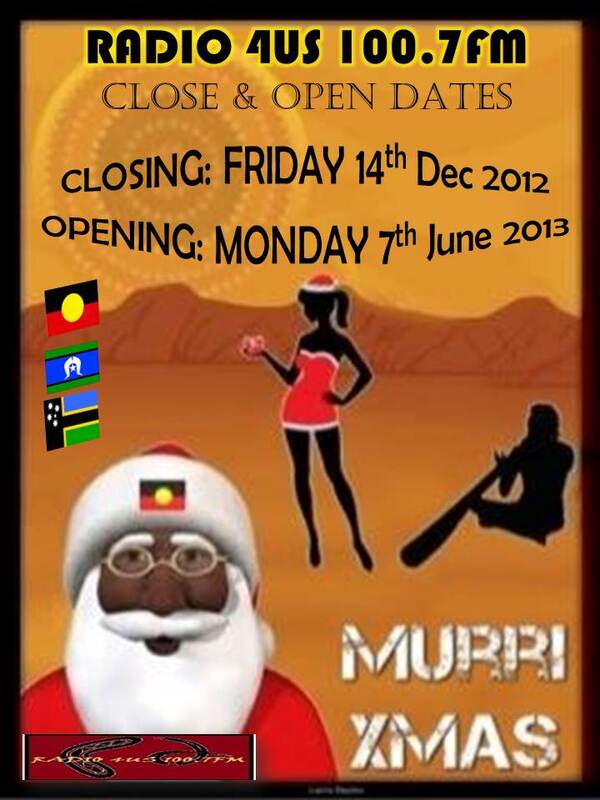 It has been a year full of challenges but also a year of growth, so once again, THANK U MOB, we wish you all a very Murri Christmas and Happi Nu Yeah! May 2014 be a year of prosperity 4US. ALL! From the crew, Danny K, Ana, Shi-Lee and volunteers, Joanne Warkil, Ani Gela, Alan Bird, Barry Doyle, Riana Kielly and of course those who have come and gone in 2013! MESSAGE FROM DANNY K: I would like to thank all his supporters/listeners throughout the years. You’ve all been just too deadly! Remember to continue – Lookin’ gud and feelin’ deadly all u mob! 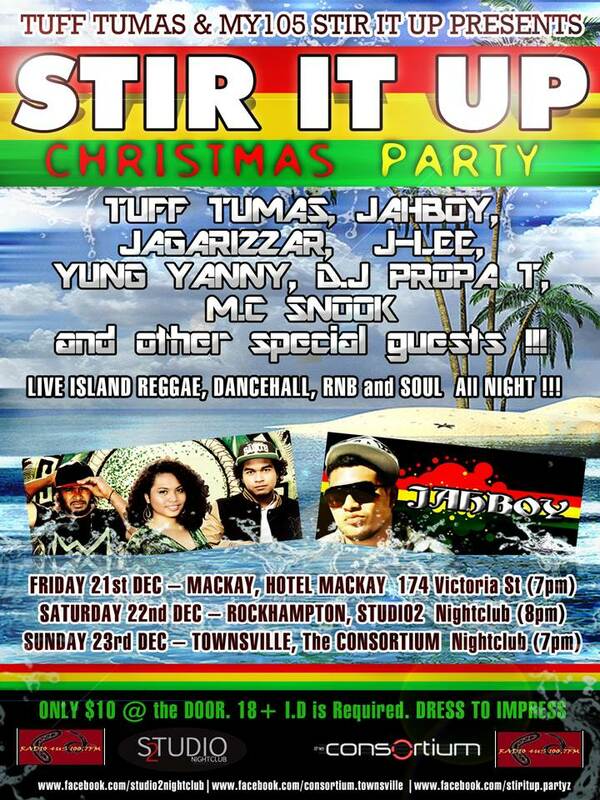 FOR ALL OF ROCKY REGION: STIRITUP XMAS PARTY 2012 @ STUDIO 2 NITECLUB – 22nd DECEMBER! $10 Entry. An early christmas prezzy, one time only event!!! Don’t miss out! See attachments! SPONSORED BY RADIO 4US 100.7FM! YES, WE HAVE MADE SOME CHANGES AGAIN! SMALL ONES WITH BIG RESULTS! REMEMBER TO STAY TUNED ON THAT ‘DEADLY’ DIAL ALWAYS WITH US! RADIO 4US 100.7FM. Alan Bird & Barry Doyle are hosting the Inu Birabay Ngani (Dharumbal Language) ” Who’s Playing What ” segment on Radio 4US 100.7FM on Saturday mornings from 10am – 11am. Our aim is to promote and share all types of sports for all ages of people in our community. We can also arrange for you to come on into the station to have a yarn on radio in person, just email in and we can setup a suitable time. We look forward to Promoting and Sharing your Sporting Stories on Radio 4US 100.7FM each Saturday morning, be sure to listen into our new Inu Birabay Ngani (Dharumbal Language) ” Who’s Playing What ” segment starting at 10am and going through to 11am.